Step 2: Remove the dates from water and squeeze slightly to remove water from them. Step 3: Slice the almonds, cashews and pistachios into thin flakes. Step 5: Take the thick-bottomed pan and heat it. Add ghee to the pan. Step 6: Add the soaked dates to it and stir well. Lower the flame and keep it in minimum. Stir continuously. Step 7: After 2 minutes of stirring, add raisins and nuts. Stir without break until the mixture is non-sticky to the pan. Step 8: Once the mixture becomes tight and non-sticky with the pan, turn off the flame. Step 9: Allow it to cool down, cool enough to touch with bare hands. Step 10: In the mean time, lay the foil over a plate and sprinkle fig seeds equally. Step 11: Once the mixture is cool enough to touch with hands, pour it to the foil taken and roll well. Step 12: If you need to serve it faster, keep it in the refrigerator for half an hour. Step 13: Or else, allow it to cool down in the room temperature. Step 14: Once the roll is hard enough to cut into pieces without breakage, remove the foil. Step 15: The magnificent Khajur roll is now ready. Step 16: Cut it into circular pieces using a knife and place one by one on a clean and elegant plate. 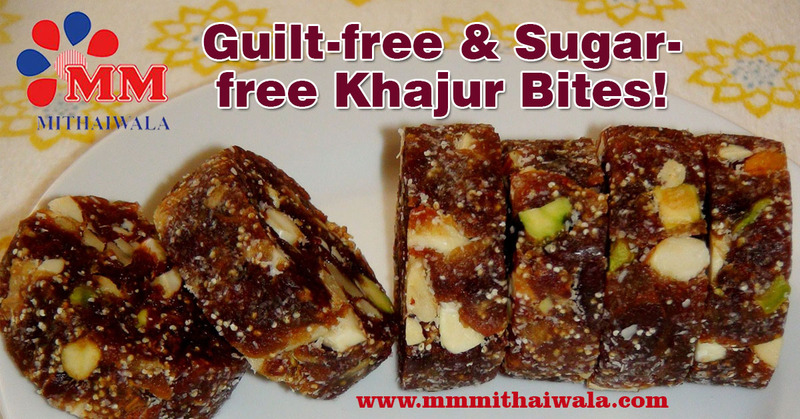 The Sugar-free Khajur bites are now ready to eat. 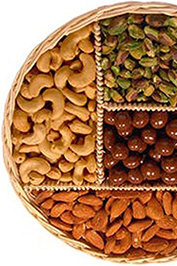 This tempting excellent snack is really healthy since there are no added sugars in it. The sweetness come from the raisins and dates itself. 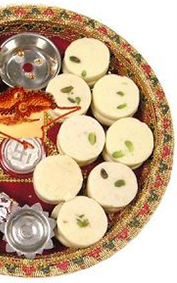 You can trust MM Mithaiwala’s products and eat delicious sweets from here. Place your orders online or call us directly. We will deliver the yummy Khajur bites at your door.